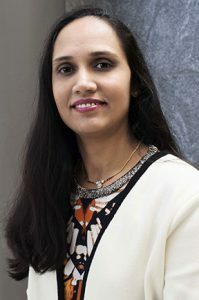 PittPharmacy faculty member Shilpa Sant, PhD has received an award from the National Cancer Institute, (NIH) entitled “Three-dimensional organoid models to study breast cancer progression.” This grant is funded by the NCI under the Cancer Tissue Engineering Collaborative (TEC) research program to support the development and characterization of state-of-the art biomimetic tissue engineered technologies for cancer research. The funded proposal aims to develop a three-dimensional in vitro organoid model that recapitulates key hallmarks of progression of non-invasive breast cancer to invasive disease. The goal is to discover key hypoxia-induced factors involved in initiation, maintenance and spatial distribution of invasive breast cancer cells, using 3D tumor organoid model and computational modeling approaches. 1) What causes some non-invasive breast cancer cells to become migratory and develop into invasive tumors? 2) How and where does the migratory phenotype emerge? The mechanistic understanding gained from these studies will improve diagnosis, prevent patient overtreatment, and lead to the development of treatment strategies to arrest invasion at the pre-invasive stage. Sant is an assistant professor of Pharmaceutical Sciences with secondary appointments in the Department of Bioengineering, McGowan Institute for Regenerative Medicine and UPMC-Hillman Cancer Center.